Moist Heat can reduce muscle spasms, reduce joint stiffness, and make soft tissue more flexible. Heat can be used to help loosen tight muscles and joints during a warm-up period before exercise. Heat is not used the first few days after an injury or while your injury has any swelling because heat increases blood flow and can worsen swelling. Heat is typically used on chronic (older than 4-6 weeks) injuries and pain. Moist heat is more effective than dry heat because it penetrates more deeply, which increases the effect on muscles, joints, and soft tissue. 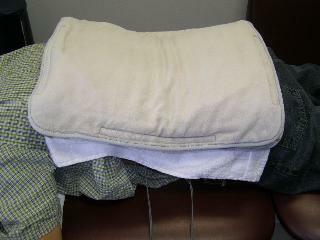 Moist heat is typically applied using moist hot packs that are stored in a hydroculator at 160 degrees. A moist heat treatment usually lasts for 15 to 20 minutes.